Webmaster note: Tom had a great fondness for Maybole and over the years was a regular contributor to the website. His wit and wisdom will be greatly missed. Below are Tom's obituary and a eulogy given by his son followed by excerpts of some of his correspondence with the folks in Maybole and two very humorous stories he shared with us. It is with sorrow we announce the death of the Reverend Tom McQuiston on July 23, 2007 at the Shoal Lake hospital. He was surrounded by his family & the music he loved. He is survived by his wife of 47 years Morag and children Marion Howard (David) and Duncan, grandchildren Katrina & Stephen. By brothers Iain & Fiona and Bryce & Sheena. Sisters-in-law Marion Farrell, Fiona & Michael Hewitt, Heide Duncan & numerous nieces & nephews. 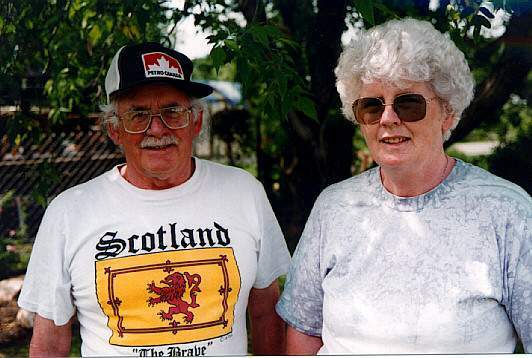 Tom was born in Maybole, Scotland and came to Canada with his young family in the summer of 1966 & settled in British Columbia. He held numerous careers over the course of his life, from janitor to gas jockey to chicken farmer. In 1976 he chose to return to university for his new calling, the priesthood. In 1979 he brought his family east to Brandon, Manitoba. He finished his internship at St. Matthew’s and was sent to the “mini diocese” of Glenboro with 6 parishes. After 2 years there he returned to St. Matthews for the next 4 years & finished his career in Birtle, Manitoba. After retirement he pursued his other passion, gardening. Together with his wife Morag they turned their yard into a show place & even winning awards. The funeral service will be held on Friday, July 27, 2007 at St. George’s Anglican church in Birtle at 11 am and a service of Internment of Ashes at the Cathedral Church of St. Matthew, 13th Street in Brandon on Friday, July 27, 2007 at 3pm. In lieu of flowers, donations to the Wider Parish of Birtle, PWRDF or a charity of your choice. Arrangements with Braendle-Bruce Funeral Services, Russell, Manitoba. I would like to start out by reporting that distiller George Ballantine and Son LTD have reported a sudden drop in sales. Anyone with stock should probably sell now!! Seventy-seven years seems like a long time, but at the same time it seems too short to know someone like Tom McQuiston. A life that saw thirteen different US presidents, four British monarchs and thirteen Canadian Prime Ministers. A life that saw events that shaped the world we live in today, and a life that shaped more lives than can easily be counted. Those who knew Dad could always count on a warm smile, a quick flash of wit and an infectious laugh. He managed to fit in a diverse amount of interests into his life: music, janitor, gas-jockey, horticulturalist, farmer, church minister, camp director and most importantly family man. He married Morag, the love of his life and was with her for forty-seven love-filled years. He had two children, Marion and Duncan, a wonderful son-in-law David, and two grand-children, his ‘Katrinka’ and ‘Stevie-Wonder’. Dad enjoyed meeting people everywhere he went, and when he couldn’t get out to meet people he plugged into a new resource, the Internet. I do not know how many people he met online, but I do know that he loved this new experience. (not bad for a person who needed help with his VCR!!) 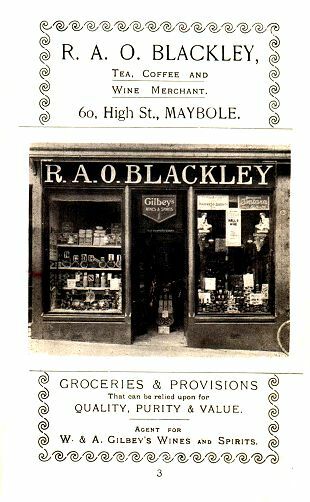 He contributed to the content of various sites, including the Maybole and Birtle homepages. Dad had a mischievous streak to him that he would pull out whenever he felt like it. From rubber insects inserted into beds to ‘re-decorating’ a person’s lawn and then dressing up as a police inspector to investigate, his love of a good laugh kept all around him greatly entertained. His love of ‘performing’ led him to do plays, from a scientist in a small town play to ‘the ruler of the King’s Navy’ in HMS Pinafore. Interacting with people was a true joy for him. Dad collected art, creating some of his own with needle-point and photography. He was always proud to show things off, be it things of his own or the various accomplishments of his family. After his well-deserved retirement he settled in the town he had grown to love, Birtle. He loved the people and the setting, and was always first in line to welcome a new doctor, several of which became fast-friends. Even when his health started to decline he still made time for people and family. The door to the house (and the cabinet) were always open. His zest for life and all that it offered kept him going, right up to the end. I know we will all miss him greatly, partially because he is gone, partially because of wanting to be with him, and partially to see what he might have come up with next for himself!! This will seem an odd reference, but whenever I see footage of Queen Elizabeth II in Ottawa for the signing of the Constitution and that wonderful moment when Peirre Tredeau is walking behind her spinning a pirouette I always think of Dad as having the same sense of humour. I ask you to keep all the fond memories you have of him close to your hearts. I thank all of you for sharing in his life with us. (January 2003) We are now back in Birtle. Yes I have retired again for the sixth time!! I was supposed to have been at the cathedral for only three months, however it turned out to be ELEVEN! (March 2002) ....As for myself. Well to put it in a short manner, I am back working!!! Last fall the Rector of the Cathedral in Brandon was elected bishop of the Diocese of Brandon. That meant that he really had to quit at the Cathedral and move to the "Pentagon", that is the Synod Office, half a block from the Cathedral. He asked me if I would "come out of hiding" and run the Cathedral until someone a bit younger be appointed to the post. So, here I am at the Cathedral. I have been here since the beginning of January. We had to move into the city as it is a 90 mile drive to Birtle. Brandon is a city of about 40,000, and is really a large rural community. I guess we will be here for about another five months or so. You will see from the name of the sender that I just might be a wee bit familiar with Maybole. So I write to you to congratulate the compilers of "Maybole, Past and Present" for a wonderful job well done. My brother Bryce sent me a copy and I have been gleaning the pages to see who I can identify. I haven't found myself yet, but perhaps the local polis didn't have my picture!! I have been writing back and forth with Bryce and my brother Iain to try and bring to light some of the local worthies, and we are having moderate success. But, you have to remember the years are advancing and the eyes are growing a bit dim. The photo to the right was taken around 1952?. It was taken in the back yard of our house on Cargill Road. In the background are a house or two on Gardenrose Path. I have a story, told to me a long time ago, about the Reverend Roderick Lawson. (see story below) It was told to me many years ago by an old man who had some connection with the town. Of course, he is long dead. He was a dentist in Glasgow. His name was McCrindle. With kind regards, and again, congratulations on your very fine production. Tom McQuiston was a member of the graduating Class of 1946 - Carrick Academy. He attended the class reunion held in 1992. 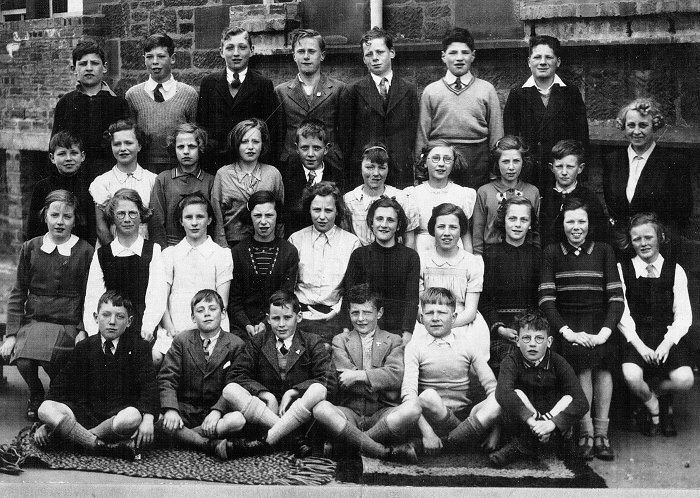 In the Cairn class photo of grade 8 from 1942 on the right Tom is sitting in the front row, third from the left. I remember Mother mixing butter and margarine together to eak out the butter. But of course we had no refrigeration and the butter went rancid. So that experiment was a disaster! Father was an ARP warden and when the siren was sounded he had to get out of bed, dress and go to the Wardens' Post which was on Ladyland Road near by Kirkoswald Road. We lived at that time on the corner of Cargill Road and Gardenrose Path, and of course the gate over the tracks at the station at that time was closed, and he had to go around by the road bridge. The usual thing however was that he would be about 'Teeny Hannah's' when the 'All Clear' was sounded, and he had to turn around and come home. Not a happy father!! The only other thing that I can remember was when a German plane was shot over Clydebank and managed to limp away from the fray only to crash land somewhere near Gallows Hill. I remember going to see it. The three Germans walked into a farmhouse and gave themselves up. Mr. A. B. Coburn - Headmaster Cairn School. As remembered by Tom McQuiston. "I was about nine years old when I first attended Cairn School. You must remember in those days the teachers were seen as 'gods' and as for the 'Heedmaister', he was above all things. I remember the features of Alex Coburn in this way. He had a shock of hair that started almost right above his eyebrows and was swept straight back over his head. (Boy, do I wish that I had a head of hair like that now!) Of mannerisms, the only one that I can remember was that he had a habit of putting both hands over his face and rubbing his face vigorously. There were times when I thought that he was going to rub it all away!! One of the other things that I remember was his ring. He had a black ring on his finger, which one I cannot remember, and I was told that it was made of polished lava. It was very impressive. (It may have been onyx.) Whenever he came into the classroom all the pupils stood until told by Mr.Coburn to sit down. But that happened when any adult person came into the classroom, well maybe, except for the Janitor. Of course it must be remembered that Britain was at war in those days. It was at that time I learned to knit. We knitted nine inch squares that were eventually, with others, stitched into the size of a blanket and sent to the men in the submarines. But, I digress. Alex Coburn was a wonderful musician. He could play anything on the piano. At least once a week he would come into the classroom and have us sing. I think that there was a piano in each classroom. He would screw up his face, rub it, and standing, would play the piano with what seemed like ten hands!! Oh, it was not a concert, it was to accompany us to sing. And the songs were, (this sounds like the Oscars), Elgar's "Land of Hope and Glory", and the Sailors Hymn, "Eternal Father Strong to Save". I have never forgotten these two works, and to this day when the hymn is played, and I must admit that it is not sung too often in almost land locked Manitoba, my thoughts go back to the days at Cairn School and Alex Blue Coburn." Note: Mr A. B. COBURN retired as Headmaster of Cairn School in 1954. He had been appointed to his position in 1927 and was only the second headmaster the school had had since it opened in 1890. He was succeeded by Mr J. Nicolson. This is a story, told to me a long time ago, about the Reverend Roderick Lawson. The Reverend gentleman had a club foot. It was his custom to come down the High Street and go to the store that is shown in the Pocket Guide as that belonging to R.A.O. Blackley. The stone step had become worn over the many years of feet crossing it, and this was very handy for Lawson who managed to swing his club foot over it without having to lift the foot too high. Well of course we never shy away from progress, and the store keeper decided to replace the step with an unworn one. Everyone "oo'd" and "ah'd" at this improvement. That is until Lawson come walking into the store. Not knowing about the step, and therefore not lifting his foot, the reverend gentleman caught his toe on the step and measured his length along the floor of the store. Would you wonder he never shopped there again.